Sibling rivalry is easily identified. If you noticed, your child may often push, shout, or even vie for your attention. Being self-centered, they would often think that things seldom go their way and often utter the phrase ‘That’s not fair!’. This can happen in any family with two children or more. Undeniably, it even happen to us when we were young ourselves. 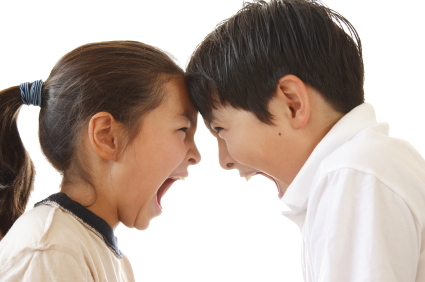 Most of the time, sibling rivalry begins when older child notices the arrival of a newborn. She does not get the undivided attention anymore and realized that everyone pays more attention to the younger child. Always promote mutual love, care and share between your kids. Provide opportunity for them to do things together like swimming, reading or playing. This will foster good relationships. Should you get gift for a child for a particular occasion, explain to other child that he will get his turn. Ensure each child gets peaceful sleep away from the awakened child who may be noisy. Take turn in playing toys or watch TV. Do not always require the older ones to give way to her younger sibling. Get each child to keep care for their own belongings. Teach each child to ask for permission from other sibling before playing with her toys. Encourage them to hug, kiss and greet each other everyday and night. Say lovely things to each child about his/her sibling like ‘Your sister folded this boat for you. Go and thanks her and give her a big kiss!’If You Are ExpectingIf you are expecting and would like to build a great relationship between the kids ahead, carry out the gift exchange between the kids. Get two sets of gifts; one for big sister to newborn and the other for newborn to big sister. Carry out the gift exchange when the kids meet for the first time, usually at the hospital. Ensure the older child that she will be loved by everyone after the arrival of newborn. Having said and implementing all the above, sibling rivalry may still occur. After all, kids will be kids. But it is just a passing phase and they will learn to love and treasure each other more as they grow.